—Can you tell us about how hitoe was developed? 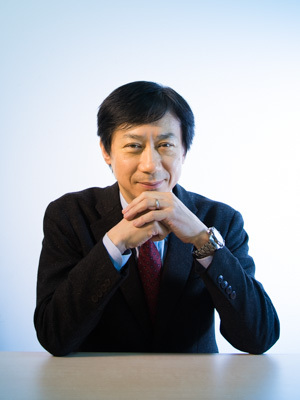 Tsukada: Originally, we were working to develop treatments methods for difficult to treat illnesses such as strokes and spinal cord damage, restoring function by inserting ultra-fine electrodes into the brain and spinal cord and electrically complementing nerve activity. It is difficult to physically connect nerves accurately after they have been severed by rupture of a blood vessel or other injury, so we attempted to restore functionality by bridging them electrically. In animal trials, we have actually been able to restore motion to limbs that were not previously able to move. However, there was a major technical issue with these methods. The electrodes inserted into brain and spinal cord were generally metal needles, which were not flexible. This would cause inflammation where where they were inserted, causing further damage to the tissue and ultimately making the injury worse. One attempt at resolving this issue was to coat silk thread, which is used for surgery, with a conductive polymer material called PEDOT-PSS. Silk thread seemed like a likely base material for electrodes because it has long been used to suture injuries in surgery and should be biologically compatible, and it is also strong and easy to handle. On the other hand, conductive polymers materials are a hot topic and have broad potential. PEDOT-PSS is susceptible to water. Initially, we would attach it to the surface of the silk using electropolymerization, but it dissolved and the electrodes were damaged when placed in water, even though it held in saline solution. After many such failures, we consulted Dr. Nakashima, who was experienced in conductive polymer research, and development of hitoe began. Nakashima: Actually, there are two different types of conductive polymer. The first are so-called conductive plastics, for which Prof. Hideki Shirakawa won a Nobel Prize in 2000. These are soluble in organic solvents. We first began research on these types of materials. However, Dr. Tsukada was concerned about hydrophilic conductive polymers. Hydrophilic properties are essential for use in living bodies, but these would dissolve and wash away when placed in water or a cell. Dr. Tsukada came up with many ideas for how to attach them to thread and fibers so that it would not get stripped off. Tsukada: If we could actually develop it, we could insert it into the body, and also attach it to internal organs. Our dream grew from this great potential, we both became engrossed, and even enjoyed advancing our research. —Did you initially intend to do all your research with silk thread? Nakashima: Yes, we did. Just before we spoke with Dr. Tsukada, I worked on research with PEDOT-PSS for a year in Australia, and I was looking for a way to use the knowledge I had gained and what to do next. Finally, we found a way to coat silk thread well with PEDOT-PSS, by just mixing it with a bonding molecule, soaking and heating it in solution. That was in September 2012. 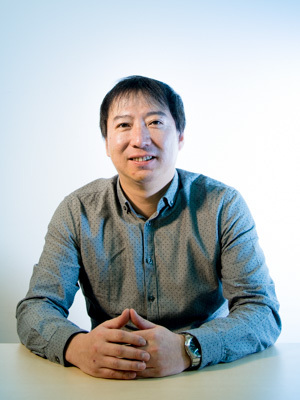 Tsukada: We immediately developed a functional thread material using this method, and confirmed that we could use it as electrodes to record stable nerve signals over long periods of time in animal tests. It also occurred to us that we could also use this method to coat fibers, not just thread, with PEDOT-PSS. If fiber could be coated, and it did not dissolve in water, it could also be washed. If it could be washed, it could be used in hospital wear, for medical diagnostics, and even at home for remote medicine. And so the dream quickly expanded. —Dr. Tsukada, you were originally a surgeon, but then you moved to basic medical research, didn’t you? Tsukada: Yes. From my experience in clinical pathology, I long felt the need for bio-electrodes that minimized impact on patients. As an example, electrocardiograms are used to study heart function and electrodes must be attached to the skin for long periods of time to do so. The skin can sometimes react to the tape or gel used to attach them, particularly in young and elderly patients, and this can fester and lead to infection. I always felt sorry for these patients. We realized that if we could make electrodes that could be attached to the skin using our fiber material, we could design with materials that breathe and fit well, greatly reducing the impact on patients. We also tried synthetics and various other materials besides silk. 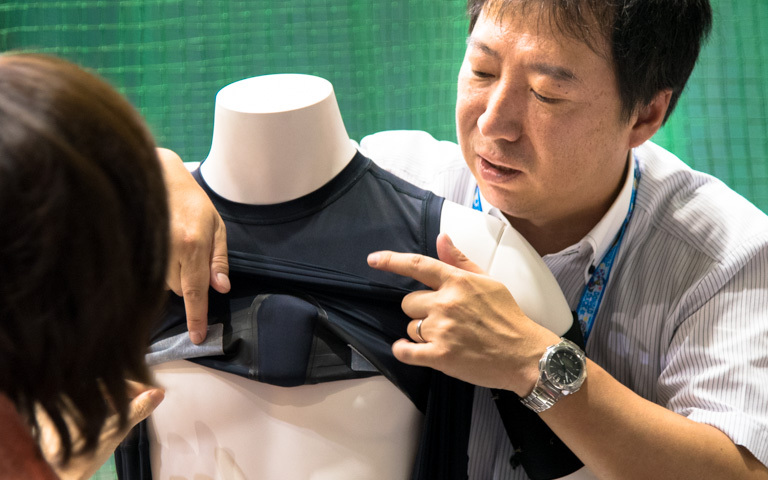 When we attached electrically conductive fabric to one of these, a Silky-dry undershirt sold by Uniqlo, we found it excellent for measuring biological signals such as heart rate. Then, having narrowed down to a form of underwear, we were looking for development partners, and coincidently made a connection with Toray Industries, which is the provider of Silky-dry materials. —Initially you were studying this for medical treatments, so at what point did you begin developing sportswear? Tsukada: Actually, it was relatively early when we began talking about using it for sportswear. Both Dr. Nakashima and I like sports, so in looking for potential applications, we actually used prototypes to measure our heart rate while running. Looking at heart rate while running suggested that it could also be useful for training, such as helping to set a pace. In commercializing hitoe, speaking with the sportswear manufacturer, Goldwin Inc., also propelled us toward practical applications. One of my hobbies is mountain climbing, and everyone in the development department at Goldwin is also fans, so they were quite excited to advance development. At the same time, Dr. Kashino and Dr. Kimura from the SBS Project began talks quite early, so implementation as sportswear advanced quickly. 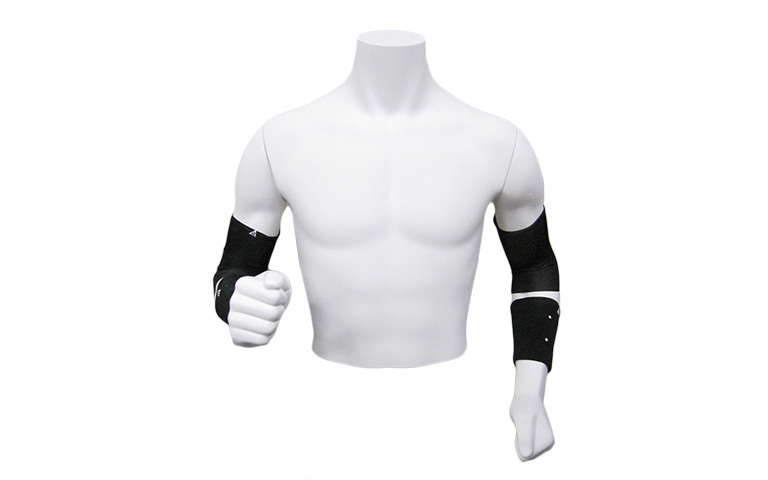 As a result, the new functional material, hitoe, was released in January 2014, and in December, Goldwin released the first training wear product in Japan, called C3fit IN-pulse. It incorporates a wearable sensor function that is able to measure heart rate by simply wearing the garment. This product is currently being advanced by adding new functionality to expand its range of applications. Nakashima: The products currently being sold are compression inners, so they fit tightly to the skin, but we are collaborating with Toray and other NTT Laboratories to develop other types of garment and expand the range of choices, including ones that are a little more comfortable or suited to more body types and applications. —What mechanism does hitoe use to measure heart rates? Tsukada: The heart operates by contracting and relaxing, and the cells of the heart muscle produce a small amount of electricity with this activity. When this happens and the tissue is stimulated all at once, a sharp electrical wave, or pulse, is created. Electrical pulses from this potential difference can be read by placing electrodes at two locations on either side of the heart. Nakashima: Looking inside the garment, you can see the electrodes of hitoe fiber attached inside in two locations on either side of the heart. The electrical signals here are collected by a transmitter and sent wirelessly to a smartphone or other device, so the heart rate can be checked. Incidentally, hitoe is not the only fiber able to conduct electricity, and other products have been created. These normally have a coating of metal such as silver and feel stiff or hard to the touch. Products with vapor-deposited silver also repel water, so they are not comfortable on the skin, cannot absorb moisture and are not suitable for garments. In contrast, hitoe is very soft, breaths, and absorbs water, so it is perfect for sportswear. Tsukada: This year we advanced hitoe further, developing a version able to capture electrocardiograms. This enables the electrical activity of the heart to be visualized as a waveform, greatly expanding its medical applications. This year, in August 2016, notification and registration of hitoe electrodes for medical devices was completed, finally achieving implementation of hitoe for medical uses. We are also already developing prototypes of products for measuring myoelectric potential, and advancing talks to create products. As with heart rates discussed earlier, electromyograms measure the electrical activity of muscles using two or more electrodes. The ability to measure myograms and acceleration would play a revolutionary role in sports metrics. Nakashima: This type of hitoe, able to measure myograms is not difficult or uncomfortable, and is similar to wearing an athletic support on the body part being measured. Earlier myogram equipment was very expensive, and electrodes were troublesome to attach. Stickers and wrapping with tape was necessary, and they came off easily and hindered movement during exercise. Simply getting ready could take almost an hour, so it was very inconvenient. The supporter-type hitoe electrodes can be put on immediately and do not affect movement, so they can be used to take myograms easily and at any time. —What is made possible by being able to take cardiograms or myograms, by simply putting on a device like this? 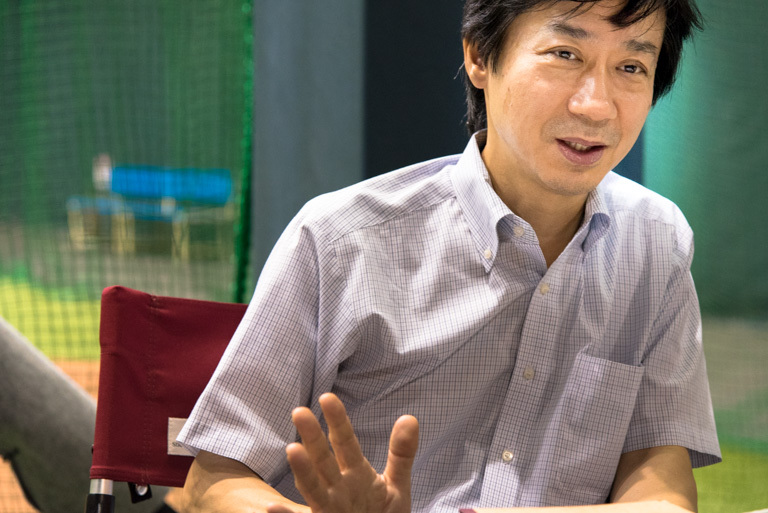 Tsukada: The most important point is that anyone at any time can take these measurements in real time. With conventional instruments, measurements could only be taken in a controlled environment such as a hospital or laboratory, and only limited measurements could be taken using the specialized equipment. However, by simply wearing a garment and sending the data to a smartphone where it can be visualized, the state of an athlete or patient can be measured in real time and in diverse environments. Data can also be collected over longer periods of time, so it can be stored up. This will certainly be useful for doctors and researchers, but there will also be many applications for athletes and patients themselves, as well as supervisors, coaches, medical staff, and even people with no particular specialist knowledge. Measurements can be taken and used in everyday training, health monitoring and other areas.